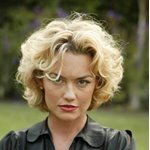 Kelly Carlson hails from Minneapolis, Minnesota. Her solid Midwestern upbringing had a profound effect on her personality, and Kelly credits her mother and godmother as her greatest supports while growing up. "I call them my two mothers, because there's no way in the world I would be where I am without both of them," she explains. Kelly is an accomplished equestrian; she started riding horses when she was only 4 years old. Once she grew up, however, Kelly turned to acting, appearing in small-time productions in Minnesota. Before long, she moved on to modeling in ad campaigns for Miller Lite, Rembrandt, and Oliver People Sunglasses, among others. But Kelly tried to keep up with acting, appearing in theatrical productions of Vanities, Cheaters, Girl's Guide to Chaos, Charlotte's Web, and Can't Trust the Man. She also took bit parts in films like 3000 Miles to Graceland (2001).